With an annual production capacity of over 200,000 vehicles as of 2018, Magna Steyr is the largest contract manufacturer for automobiles worldwide. The Austrian automotive company has helped major car manufacturers such as Mercedes-Benz, BMW, Aston Martin, Audi and Land Rover develop some of their most iconic cars. 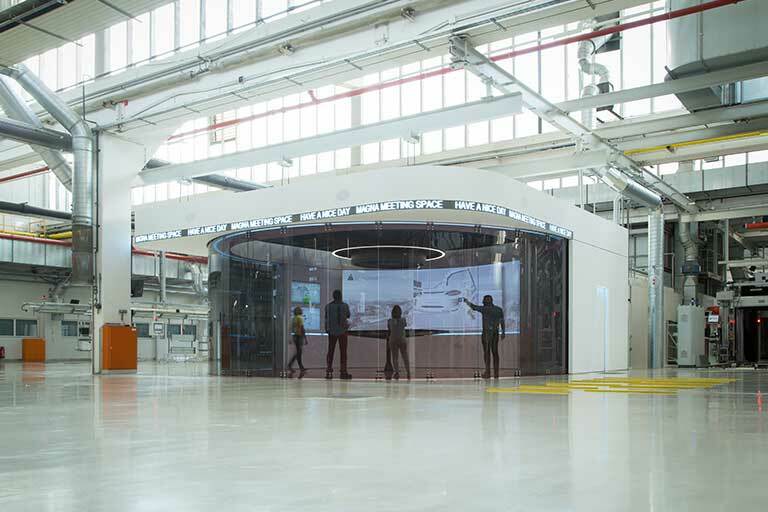 Recognising the importance of maintaining pole position in such a fast-moving industry, Magna Steyr has recently invested in its continuing success by undergoing an Industry 4.0 digitalised production process transformation. 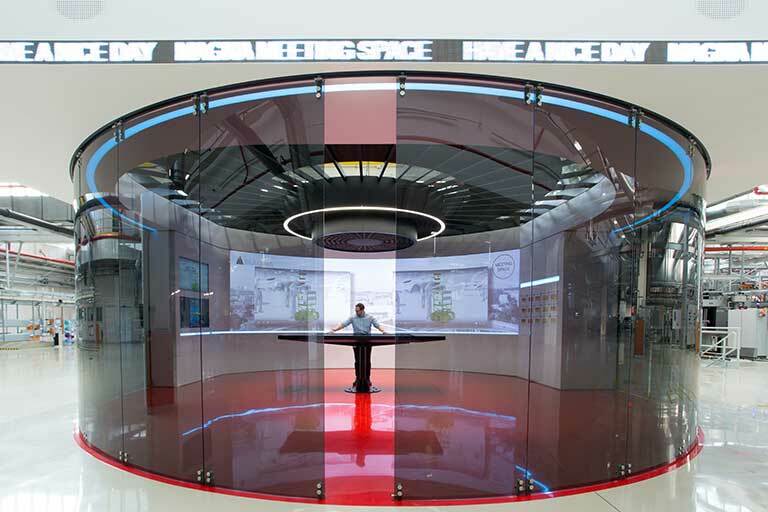 The result is best described as a Minority Report-style, immersive, smart meeting space positioned as the 24/7 beating heart of Magna’s production environment. 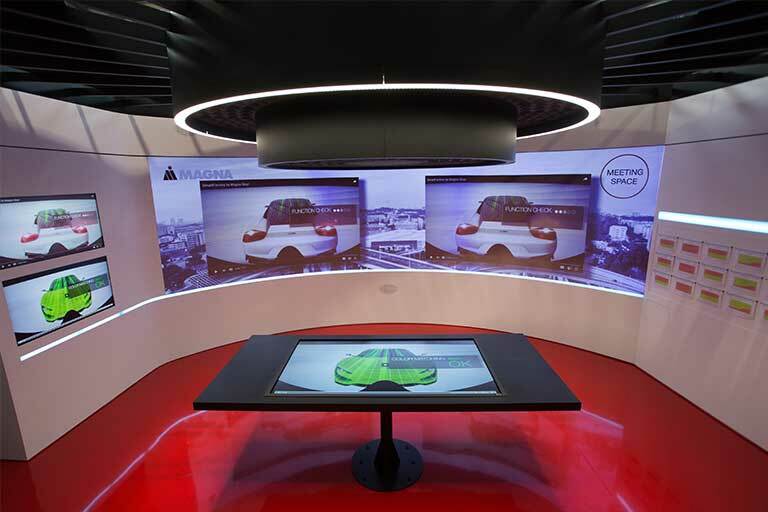 Situated directly on the shop floor, it uses Digital Projection’s solid-state E-Vision Laser 6500 projectors to ensure the most clear, crisp and reliable display of information. 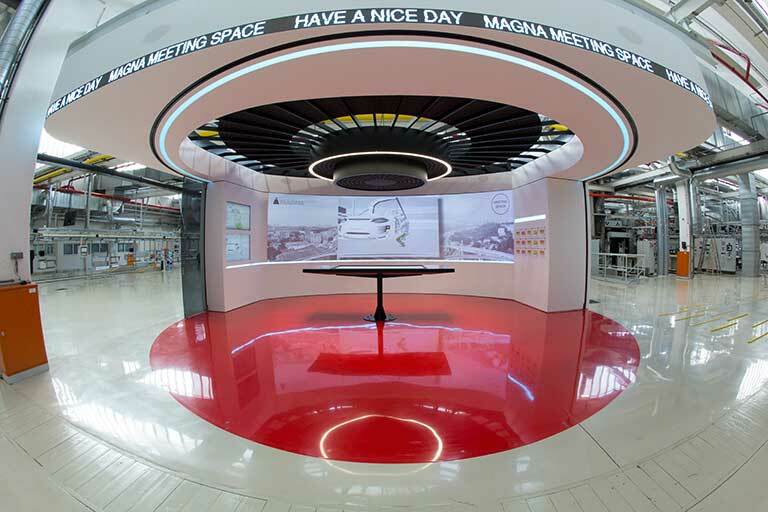 Magna Steyr’s “Meeting Space” is a pioneering example of the Industry 4.0 ‘smart factory’ where cyber-physical systems monitor physical processes and create a virtual copy of the physical world from where to make decentralised decisions. Over the Internet of Things, these cyber-physical systems communicate and cooperate with each other and with humans in real-time both internally and across organisational services. Within the Meeting Space, the 134˚ curved back wall, transforms into a vast 730cm long by 200cm high projection surface. 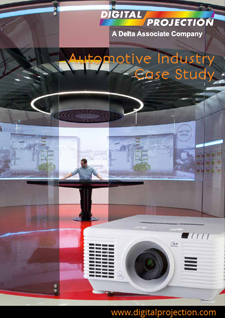 Three Digital Projection E-Vision Laser 6500 projectors combine to create a viewable surface. To the side of the projected area, two 55-inch LED displays are mounted. All visual and communication technology operating within the Meeting Space is controlled via a central 84-inch touch table, driven by a single dedicated WINGS VIOSO server platform. Redi exerts that one of the main challenges for projects of this nature is the complexity of pulling together many areas of the business. The concept was so forward-thinking that ORTLOS needed to partner with a technological expert it could trust, and after much searching, discovered VIOSO. The physical manifestation of Magna’s Meeting Space, therefore, is metaphorically the tip of a vast consultancy and planning iceberg. VIOSO specified the physical attributes of the installation meticulously conjured from Magna’s myriad business needs and functions by ORTLOS’ Redi. Due to the nature of the project, the design in its initial stages was an ever-moving feast. As the requirements of Magna took shape, the need grew from being a 150-seat meeting space originally, to a stage area that would host 300. Eventually, the design encompassed 800 viewers and participants, all needing a perfect view and a perfectly displayed content. Floor-to ceiling glass doors contain or throw open the space according to need. The space is in constant use by the whole production team, from CEO to technician. The types of meeting range from Skype calls across Europe, to perfect the specification of new car parts, amongst many other styles of technical production meeting; to new customer presentations and meetings of the Executives. Any combination of data, ranging from production-specific data to Skype calls, can be projected onto the screen and all common file types, can be used to present in full-screen or as picture-in-picture formats. The E-Vision Laser 6500 WUXGA is compact, bright and provides colour-accurate imagery alongside 20,000 hours of stable illumination. Handling all the data and content management, the WINGS VIOSO server, positioned in close proximity, is able to transmit the WUXGA (1920 x 1200) signals to the Digital Projection projectors using high quality copper HDMI and Display Port cabling. Wings VIOSO combines powerful AV Stumpfl Wings RX functionality with VIOSO Calibrator SW, which not only integrates the VIOSO Anybend software for a simple and reliable multi-projector set up, but also VIOSO’s patented, camera-based, auto-alignment technology. 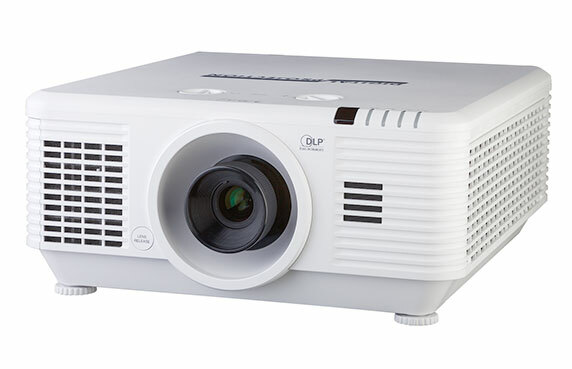 With no lamps to change, downtime from projector misalignment is dramatically reduced. However, particularly in the production environment of a factory floor on the scale of Magna’s projector misalignment must be factored in. VIOSO’s auto-alignment technology counters this as it electronically measures and builds a virtual canvas within the projected image area. Overlapping regions are then geometrically corrected and blended seamlessly, regardless of the number of projectors used, or how they are aligned.